She had her throat slit and he had his head broken. On the fifteenth Julitta was beheaded, her son was broken. 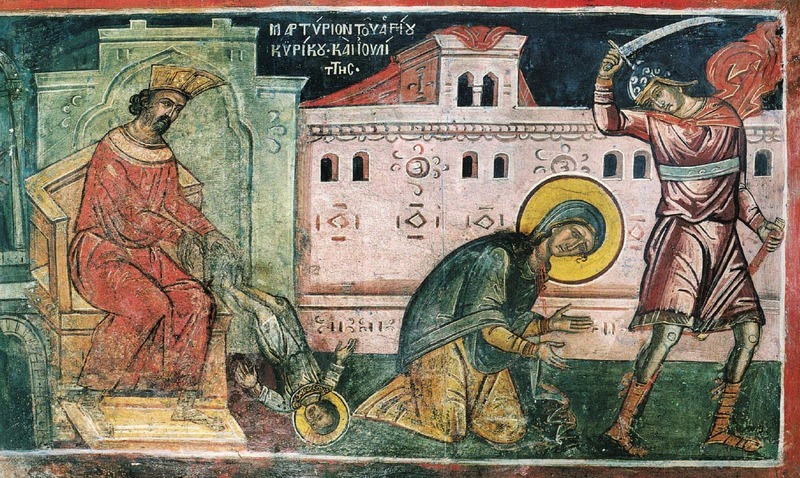 The Holy Martyr Julitta flourished during the reign of Emperor Diocletian (284-305), and was from Iconium. Fearing the persecution against Christians prevailing at that time, she took her son Kyrikos and went to Seleucia. Finding the same persecution there also, she went to Tarsus of Cilicia, where the governor was savage and inhuman, whose name was Alexander, and who punished the Christians. 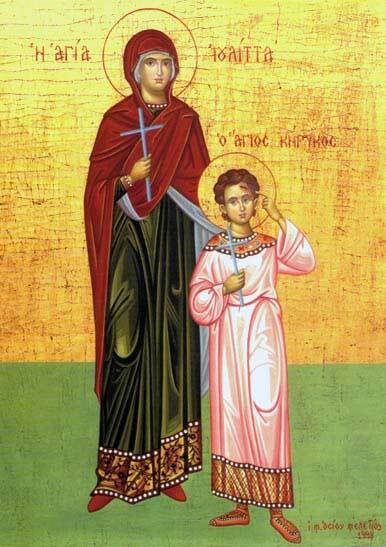 He had the Saint arrested and flogged, and separated the infant Saint Kyrikos from his mother, trying with flatteries to pull him towards himself, but was unable to, for the child looked steadily at his mother, and muttering she called upon the name of Christ. Because the Saint kicked with his leg, as much as he was able, the governor in the stomach, the governor threw the infant onto the staircase of the court. Having been struck in the head, the blessed one delivered his holy soul to the Master Christ, by Whom he was crowned with a contestant's crown. Blessed Julitta endured many torments, and was not persuaded to deny Christ, therefore she was beheaded, and the renowned one received the crown of martyrdom. Their Synaxis and Feast is celebrated in the prayer house Church of the Archangel Michael, in the place called Addo. Blessed Julitta, Christ God's rational ewe-lamb, with holy Kyrikos, her three-year-old offspring, stood at the judgment seat and with authority and great boldness they proclaimed the true Faith of the Christians. In no wise were they afraid of the threats of the tyrants; and now in Heaven, wearing precious crowns, they both rejoice as they stand before Christ our God. As the Martyr of Christ God, the chaste Julitta, in her arms bare Kyrikos, she cried out in the stadium with manful courage and boundless joy: Thou art the strength of the Martyrs, O Christ my God.